Christmas. It’s a busy time of year, full of activities, gift exchanges, gatherings and, of course, lots of good food. What would a gathering, at Christmas time no less, be without the wonderful array of Christmas goodies? There are the traditional favorites like shortbread, mincemeat tarts, fudge, and gingerbread. And then there are some creative and rather decorative additions to the list, like a no-bake Chocolate Orange Christmas Pudding, Christmas Tree Cupcakes and Chocolate Brownie Trees. These treats not only look good on a tray of goodies, but they taste good, too. V Dale is well known in her community for her delectable treats. She’s a very creative and industrious baker. She is also known for her little recipe chapbooks, celebrating the different seasons of the year and the good food that goes along with each season. 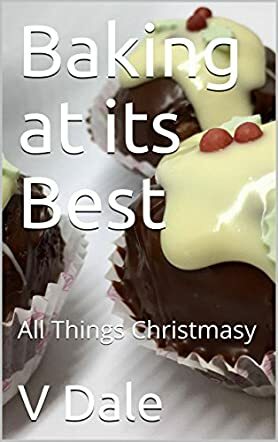 Her latest book, which she claims is the last in this series, Baking at its Best: All Things Christmasy, explores the joy of Christmas foods. Not just the sweets, because there’s also a recipe for Boxing Day Pizza which thriftily uses Christmas leftovers to make another variation on a favorite pizza theme. The recipes are well chosen and carefully laid out with a good description of the procedure. There is even a colorful photograph to illustrate the finished product, a health and nutrition guide, and an alternate ingredients list (for some of the recipes) to accommodate those people with various eating intolerances or allergies. For anyone who loves to bake and loves to create delicious and unique Christmas treats, this little chapbook is a must-have.